FAO Director-General Jacques Diouf at 2009 World Summit on Food Security. Photo: FAO/Giulio Napolitano. 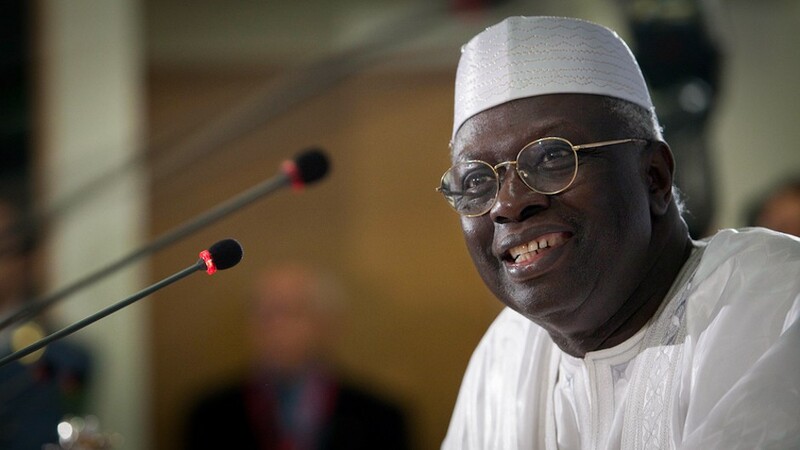 On November 13, 2009, Food and Agriculture Organization Director-General, Jacques Diouf, embarked on a 24-hour public hunger strike, in the lead up to this week’s World Summit on Food Security in Rome. Diouf’s call for action to end the scourge of hunger comes on the heels of July’s G8 summit in Aquila, Italy, where member nations pledged US$ 20 billion to support farmers in poorer countries. In September, United States Secretary of State Hilary Clinton announced the US Global Hunger and Food Security Initiative. One could be forgiven for believing that the world is running out of food. Not quite. But climate change, rising water shortages, and competition over land for energy represent important constraints on the production of the additional 1 billion tonnes of cereals needed to meet the expected 70% increase in food demand by 2050. Furthermore, world food prices are up 58% now compared to the average 2002-2004 levels, and are expected to stay higher for the next decade. Much public action will be needed to repair the current system of market mediated food security, if it is to provide a credible alternative to the politically more secure, but economically more costly system of national food self sufficiency. For this to happen, world food markets need to be made more reliable, public investment in agriculture must be increased and spent more efficiently, and national social safety nets need to become effective. Yet, even success on all these fronts will not suffice as long as US and EU agro-fuel policies maintain the link between food and fuel prices. The summit’s draft declaration reaffirms agreement that has emerged on the broad principles to tackle these challenges including emphasis on country led-plans and the need for globally and regionally coordinated actions. Yet, many tough policy questions remain about how to best restore trust in food markets, about how to invest best in agriculture, about how to build reliable safety nets in poor countries, and about how to balance the need for food and fuel security in a context of climate change. As food exporting countries such as India and Vietnam saw world food prices rise rapidly in the fall of 2007, they restricted food exports to shield their domestic markets. A perception of global food (in particular rice) shortages took hold, which especially induced large food importers such as the Philippines to buy rice at any price, thereby driving food prices even higher. As a result, trust in the world market as a reliable source of food has dramatically eroded and the quest for food self-sufficiency through own production is back high on national agendas. Richer food importing countries short in land and water (such as Arab countries and China) are also pursuing this through bilateral outsourcing of staple crop production to land abundant countries in Africa (e.g., Sudan) and Southeast Asia (e.g., Cambodia). Whether such land leasing arrangements, known as land grabs, will enhance food security in both origin and destination countries will very much depend on the transparency of the land acquisitions, the distribution of the benefits, and the mode of production (small versus large scale farming). Yet, achieving national grain self-sufficiency through own production, which must be combined with large national buffer stocks to stabilize domestic markets in the case of domestic production failures, presents a costly, and increasingly unviable alternative to countries without comparative advantages in grain production. Not only does it increase the local cost of staples, rendering many poor and deteriorating the country’s overall competitiveness, climate change is also likely to increase volatility in domestic output, forcing countries to hold ever larger buffer stocks. That said, a more market based global food architecture requires reliable and stable world food markets. This is not an easy feat either, especially not when fears arise, justified or not, of global shortages of food. Different measures to manage world food price volatility and ensure access to food for food importers under all circumstances are being discussed. To begin with, more reliable grain stock information to avoid price runs from misinformation could already help a lot. Trust can also be increased by strengthening World Trade Organization (WTO) regulations on food export restrictions to better balance benefits from the trade system between exporters that want assured market access, and importers that want assured supplies. An internationally coordinated, physical food reserve system may also be necessary and discussion remains about whether commodity index funds should be more tightly managed to curtail excessive financial speculation (either through regulation or a system of global virtual reserves). Together these actions may restore trust in world markets and foster a more politically palatable and economically efficient balance between domestic staple crop production and reliance on the world market. While more public investments in agriculture are undoubtedly necessary, even more important will be how they are allocated. The balance between investment in public and private goods deserves especially attention. Public goods include rural infrastructure such as roads, market facilities, electricity, information and communication technologies, plant and animal protection, soil conservation, and agricultural research, development and extension (RD&E). Private goods include farm inputs (fertilizers, seeds) or commodity specific promotion programmes. Farm input subsidies are becoming popular again in Africa. The governments of Malawi and Zambia for example, have been spending more than 60% of their agricultural budgets on input and crop marketing subsidies and other governments are rapidly following suit. This leaves little room for investments that markets usually fail to provide on their own and that pay off over a longer period of time such as rural roads, irrigation, and agricultural RD&E. The latter will be especially crucial to assist farmers in adapting their agricultural production systems to climate change. Increased public accountability to ensure public funds are well spent will also be necessary to sustain the renewed international commitment to agriculture. Transparency can for example be increased through the publication of more detailed reviews of public spending on agriculture and citizen report cards on the quality of publicly provided agricultural services such as extension can help to hold government officials accountable to the people they are serving. Market mediated food security pre-supposes the existence of a reliable social safety net to assist the chronically food insecure and those in need in times of crisis. The 2008 food crisis revealed that many countries do not possess such safety nets and instead revert to politically expedient but economically inefficient universal tax reductions and subsidies. Nonetheless, a review of the world’s vast experience suggests that safety net systems can also be successfully implemented in low income settings, when designed in accordance with local administrative capacity. Yet, the time to act is now, before the crisis hits. FAO indicates that first generation agro-fuels produced in OECD countries (except ethanol from Brazil) are currently not competitive with fossil fuels without the current subsidies (and tariff protection). Removal of EU and US subsidies and import tariffs is a very minimal first step to reduce the link between food and fuel markets and allow agro-fuel production to concentrate in economically and environmentally more suitable locations. Secondary generation agro-fuels that use lignocellulosic feedstock such as wood, tall grasses, and forestry and crop residues have been held to hold more promise, according to the FAO’s State of Food and Agriculture 2008 report. Nonetheless recent research published in the journal Science, also warns that the amount of CO2 released by clearing new land for such grasses may more than offset any benefits until the middle of the century and that nitrous oxide will not be beneficial. Clearly, many questions remain about how to redesign the global food architecture in this new environment of climate change, technological development, and reduced faith in market systems. Continuing attention to the world food security challenge at the highest political level, as pledged at the World Food Summit, will be most necessary. To advance the debate and foster evidence based solutions UNU-WIDER will launch a policy platform in 2010 inviting the world’s leading experts to assess different policy options based on the latest available evidence. 2009 World Summit on Food Security by Luc Christiaensen is licensed under a Creative Commons Attribution-NonCommercial-ShareAlike 3.0 Unported License. Luc Christiaensen is a former Senior Research Fellow at UNU-WIDER whose research focuses on the fields of poverty and well-being, agriculture, and rural development. He is currently employed with the World Bank. Before joining UNU-WIDER, he worked for the Africa and East Asia Region of the World Bank. Some of his recent publications include “Revisiting the Global Food Architecture. Lessons from the 2008 Food Crisis” (2009) and “Down to Earth: Agriculture and Poverty Reduction in Africa” (2007). He has a PhD in agricultural economics from Cornell University. What in the World Is Propelling Food Prices?